If you look closely at my blazer you'll notice some raindrops as a downpour hit Southern California this afternoon. Knowing that this was in the forecast for today, I debated if I should wear rainboots or not. Well, since it wasn't raining this morning, I made the choice to forgo them. It turns out I made the wrong choice! 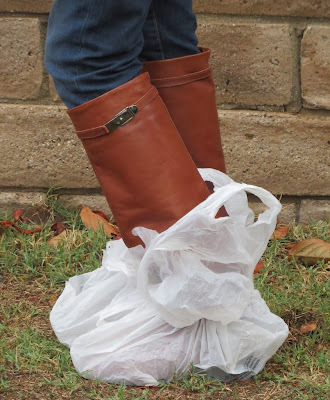 Seeing the puddles of rainwater building up in massive lake-like formations outside my window at work, I decided when it was time to go home that I had no other option than to get some plastic bags and rubber bands and construct some makeshift galoshes. Just call me MacGyver! My husband and I often commute together to work and when he came to pick me up he was laughing as I came plodding down the street in my "invention". But hey, these bags saved my boots from the rain which was worth the price of a little bit of humiliation. My boots were as dry as a bone, so I can't complain. On a side note, the fair isle sweater I am wearing today is from H&M and it was so comfy and cozy on a rainy day like today. 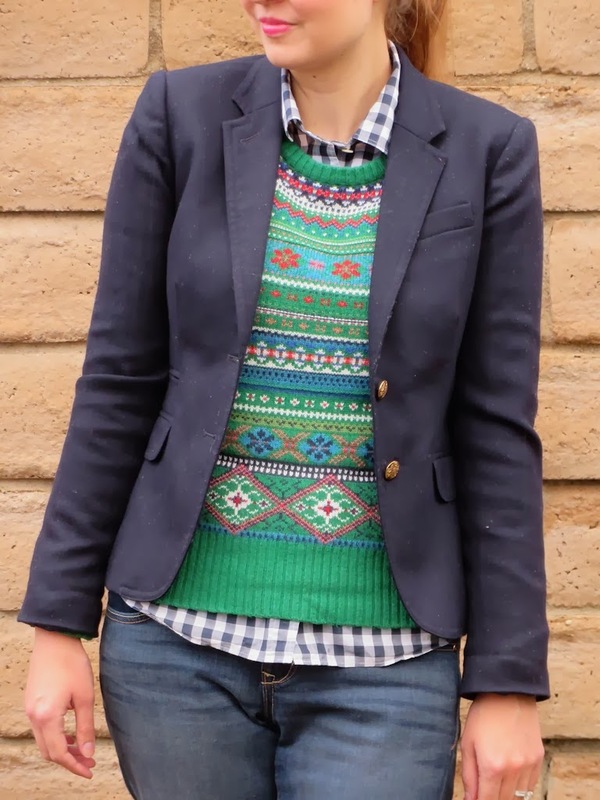 I love the green color scheme of the sweater and thought it would be perfect for a little casual holiday cheer. It even comes with a neat-o gift tag attached in anticipation of it being a holiday gift. Personally, I would fill out the gift card as followed: To: Me, From: Me. Shirt: J. Crew navy check "boyshirt"
Bags: Courtesy of Big Lots and Micheal's Crafts! Thanks! This outfit definitely kept me warm all day long, although actually with the jacket it was a little too hot! 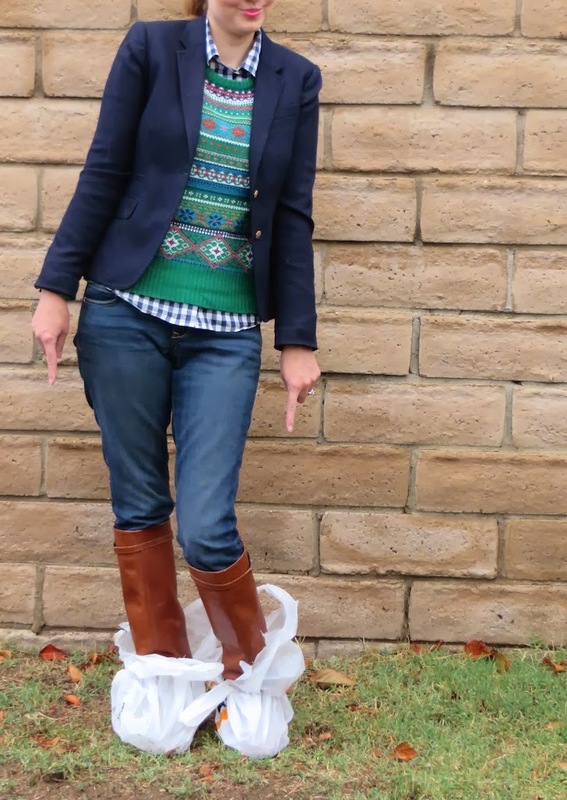 lol i laughed at the makeshift galoshes. brilliant! Thanks phiphi! This isn't the first time I've done this. I really need to keep a pair of galoshes in my desk at work!